Previous postZika Virus Saves a Pitcher's Arm? He’s a high school senior headed to a reputable D1 college program on a baseball scholarship. He’s getting about 60% of his tuition paid, but to cover the rest of the cost for the out-of-state private school, his parents will be on the hook for about 10k per year. According to my calculations, over 4 years, that’ll tally up to around 40k (yep…mathematical genius here). But he’s also a pretty good student, so he might be able to cover the remainder of the nut by bagging some academic money. His GPA is awesome, but to get the guaranteed academic money, he needs to score an 1200 on the SAT or a 27 on the ACT. He took the SAT over a year ago and got an 1190. Took it again 3 months later…same score. Took it a 3rd time… same. Even with super scoring, he fell 10 points short. … Switch the to ACT. One measly point — a point worth $40,000 to his family. Unfortunately it sounds eerily familiar to me. I see a pitcher with a history of am pain, or throwing 3-5 mph slower than his peers, shot gunning pitches all around (but not in) the strike zone, flipping up sub-par off speed stuff. Instead of buckling down and training to correct his deficiencies to improve his performance, he accepts a contract to a collegiate summer league, or heads out on a ridiculously expensive and time consuming 2 month travel ball crusade. It’s a common mistake that occurs all too often. Somehow players believe that by playing game after game after game, they’ll get better. Like our unfortunate student-athlete, instead of backing up and studying more, or taking a preparatory course, they just keep taking the test again… and again… and again… and they wonder why they keep getting the exact same score. It makes no sense and fits to the tee Einstein’s definition of insanity. Are you about to fall in the same trap? Are you throwing 3-5 mph slower than your peers? Is your strike percentage on any or all of your pitches less than 65%? Is your off-speed stuff sloppy and ineffective? Does your arm hurt during or after your outing? If you answered yes to any of these questions, the last thing you need is more games. It’s time for you to man up, look yourself in the mirror, and solve your problem once and for all. You owe it to your coaches. You owe it to your teammates. Pick up your phone now and dial 813-655-3342. 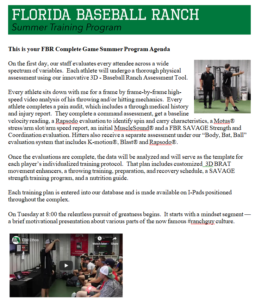 Tell Amy you want to sign up for the most comprehensive and highly effective summer training plan you’ve ever experienced. She’ll make you an offer you can’t refuse!! Click here to learn more about the FBR Summer Training Program. Can’t commit to an entire summer? Ok… but at least give yourself a weekend to be assessed, to learn our system, and to develop an individualized multidimensional training plan that will get you going down the right path. Click here to learn more about our Incredible Arm Care and Elite Performance Training Camps. P.S. May 6th is the last day to get the early registration discount… Don’t “Fuggedaboutit”. It could cost you.